Marcie has agreed to do ONE of the world's really great trails with me in the next year or two and I've been researching the possibilities. It has to be a trail that qualifies as one of the great ones and one which we have a reasonable chance of completing. First, let's define my idea of a 'great hike'. There are dozens of hikes that could be considered great because of their magnificent scenery, like the Inca Trail (20 miles, ending at Machu Picchu ), the Torres del Paine “W” circuit (50 miles through the magnificent Patagonia mountains), and the Tour du Mont Blanc (105 miles through Italy, Switzerland and France) to name a few. Likewise, there are many trails that have such historical significance that they could also be considered great, such as the Scottish National Trail (470 miles, traversing the whole of Scotland), the Santa Fe Trail (870 miles from Fort Leavenworth to Santa Fe), and the Camino del Santiago (the famous 500 mile pilgrimage to the Cathedral of Santiago de Compostela in Galicia). But in my opinion, a truly great trail ought to include not only spectacular scenery and historical significance, but be long – really long – say, 1000 miles or so long. I also crossed off any of the historical, but incomplete trails like the Oregon Trail and the Mormon Trail, since large portions of these trails no longer exist, cross private land and/or follow highways. Finally, I've also eliminated several hikes that are at high altitude, like hiking to the top of Kilimanjaro (the highest peak in Africa at 19,340 feet), the Mt. Everest base camp trek (a couple weeks of trekking at altitudes ranging from 15,000 feet to 18,000 feet), the Snowman trek in Bhutan (traversing 200 miles and eleven passes, most of which are higher than 16,000 feet), and several hikes in South America. Marcie has always had problems adjusting to higher altitudes, and we're finding that it's taking both of us longer to acclimate as we get older. Next month, we'll be doing sort of a qualifying trek in England; the Thames Path, which is a 184 mile walk from the headwaters of the Thames River to its terminus at the sea in London. While it's much shorter and easier than one of the great hikes, and we will be stopping at pubs and hotels each night, we'll still be carrying 20+ pound packs. Despite being a whole lot wimpier than one of the great ones, it will, hopefully, give us an idea as to whether we're still capable of hiking long distances carrying a pack. If the Thames Path works out, we'll try a real backpacking trip – where we actually sleep on the ground – and see how that goes. We're taking baby steps here. Map of the Great Trail - Canada. We're talking a serious hike here. The Great Trail – Canada. 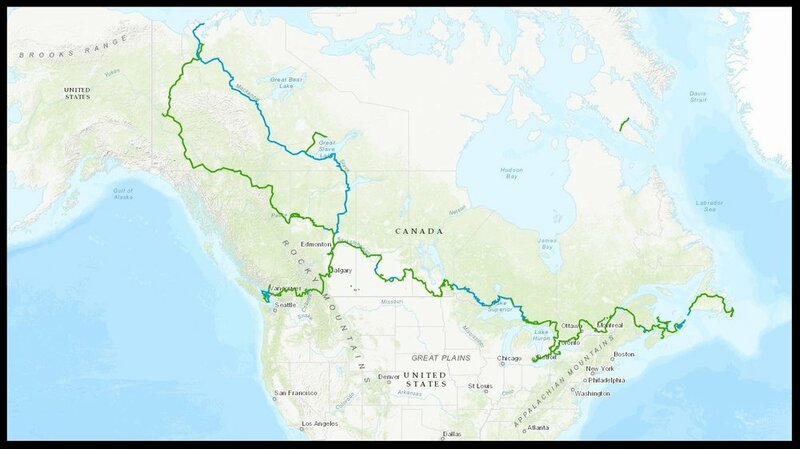 This is the longest recreational trail in the world, extending 14,913 miles through 13 provinces of Canada, and touching three oceans; the Atlantic, the Pacific and the Arctic. The idea for the trail began in 1992, and it was completed just one year ago in August of 2017. Originally, it was called the Trans-Canada Trail, and was a mere 7,100 miles, from the Atlantic to the Pacific. Sarah Jackson became the first woman to complete the Trans-Canada Trail in June of 2017, taking two years to do it. To my knowledge, no one has of yet completed the entire Great Trail of Canada, although I'm sure there are hikers pushing to become the first. Hiking it will require a commitment of at least 3-4 years, or more like 5-6 years at our 'geezer speed'! That's a rather large percentage of our remaining years, so while it may, in theory, be doable by us, I don't think it's a real contender. Appalachian Trail (AT). This is the granddaddy of American trails, and is the longest, hiking only trail (no horses, llamas, bicycles or motorized vehicles allowed) in the world at approximately 2,200 miles. It traverses 14 states, starting at Springer Mountain, Georgia and ending at Mount Katahdin, Maine, although it can be extended southward to the Florida Keys and all the way to Newfoundland if those piddly 2,200 miles aren't enough. While more than 2 million hikers walk at least part of the trail each year, the vast majority are day hikers or section backpackers, traversing only a small section of the AT. Someone who completes the entire AT is referred to as a “2000-miler”, and the number of 2000-milers increases every year. There were more trail completions in the year 2000 than there were in the first forty years combined, and in 2017, 1,186 hikers completed the entire route. While the high point of the AT may only be 6,643 feet, it is one of the more arduous trails, continually climbing and descending. Over the course of the trail, a 2000-miler will gain and lose about 89 miles of elevation – equivalent to climbing Mt. Everest 16 times. The typical time for completion of the entire trail is 165 days – just shy of six months. Pacific Crest Trail (PCT). 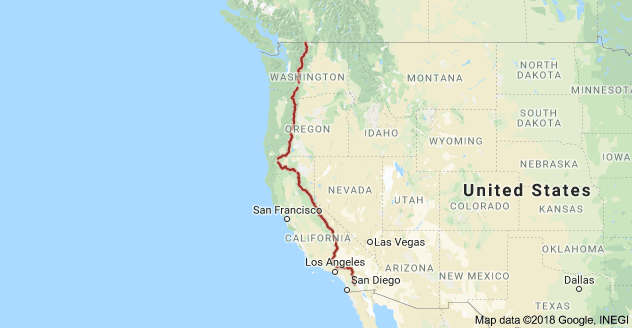 2018 is the the 50th anniversary of this 2,650 mile long trail that extends from Mexico to Canada through California, Oregon and Washington. The terrain varies from the scorching 110 degree deserts of the south to the snowy heights of the Sierra Nevadas and the volcanic peaks of the Cascades. The highest point is 13,153 feet at Forrester Pass. Just over 5,400 people have completed the entire trail. Even though it is longer than the AT, the average distance hiked each day is greater on the PCT, so the average time to complete the trail is slightly less - about five months. In some years, sections may be closed due to wildfires. This year is especially bad. As I write this, there are fifteen sections closed, ten of which are in California. Continental Divide Trail (CDT). The CDT extends 3,100 miles from the Mexico/New Mexico border in the south to the Canadian/Montana border in the north. Since it follows the Continental Divide, much of the trail is at high altitude. The high point is Gray's Peak in Colorado at 14,278 feet and the low point is 3,900 feet in Columbus, NM. There are several alternative routes, especially through Colorado, that can be taken depending on conditions. Most hikers complete the trail in 4-5 months. The trail is a combination of many shorter trails, and is currently only 76% complete. Some sections follow existing roads, or require traversing cross-country with few or non-existent trail markers. Like the PCT above, the CDT often has sections closed due to wildfires. Pacific Northwest Trail (PNT). The PNT is an east-west trail, starting at the northern end of the CDT in Montana and traversing 1,200 miles to the Pacific Ocean. While some popular sections of the trail draw millions of people each year, there are very few through hikers. In 2017, only about 100 people attempted the entire trail. Most hikers complete it in 60-70 days. Florida National Scenic Trail (FNST) or Florida Trail. The Florida Trail differs from the other trails in that instead of crossing deserts and/or mountains, it passes through swamps, bogs, sand and scrub. Instead of sighting bears and rattlesnakes, an FNST hiker is likely to see alligators, different types of rattlers and water mocassins. The hiking season is also different – October through April rather than the summer months. Some sections require wading through swamps while in other parts , the hiker can look forward to slogging through deep, gooey, marl mud. Depending on the route, the trail length is about 1,300 miles, give or take a couple hundred miles and extends from the Gulf Islands National Seashore in the south to the Big Cypress National Preserve in the panhandle. North Country National Scenic Trail. This trail, all 4,600 miles of it, starts in the Adirondack Mountains in New York, crosses Pennsylvania and Ohio, travels up through both peninsulas of Michigan, then across Wisconsin and Minnesota, before terminating in the middle of North Dakota. Currently, only 65% is complete while the remaining 1,600 miles follows existing roads. To my knowledge, no one has completed it in its entirety. American Discovery Trail. Now we're talking a real hike. Depending on the route, this trail extends between 4,800 and 5,200 miles, across the U.S. from the Atlantic coast at Delaware's Cape Henlopen State Park to the Pacific coast at California's Point Reyes National Seashore. The first people to complete it were Joyce and Peter Cottrell, in 2002. They were both in their fifties and took just over 17 months to hike the entire length. It is a combination of existing trails, rail-trail conversions, bike paths, greenbelts and country roads. The routes split in western Ohio. 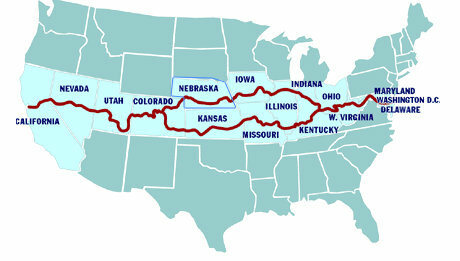 The northern route is shorter and goes through Indiana, Illinois, Iowa, Nebraska and Colorado, while the southern route crosses Kentucky, Missouri and Kansas, following parts of the Santa Fe Trail before rejoining the northern route in Denver. The PCT, CDT and AT are called the “Triple Crown”. Someone who has completed all three is called a “Triple Crowner”. One couple that I know of, Ken and Marcia Powers, have completed the Triple Crown, as well as the American Discovery Trail, making history with a Grand Slam. The Great Western Loop combines the PCT, PNT and the CDT for a total of 6,800 miles. The only person I know of to complete this epic hike is Andrew Skurka who did it in 280 days and averaged an amazing 33 miles a day. We've just barely covered the bigger North American trails and haven't even begun the great trails in other countries. So many trails – so little time. See you next week.